Lembaga Penjamin Simpanan - LPS or Indonesia Deposit Insurance Corporation (IDIC) is the independent financial institution in Indonesia which was formed to promote a sound and stable banking system in Indonesia. LPS was founded by the Government of Indonesia to insure bank depositors’ deposits and also to maintain the stability of the banking system. LPS was formed on 2004 and officially operated on 22 September 2005. 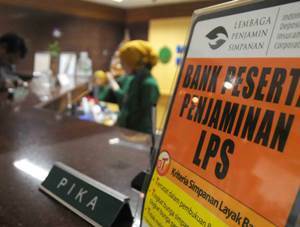 LPS was formed under the Republic of Indonesia Law Number 24 of 2004 concerning the Indonesia Deposit Insurance Corporation/IDIC (Lembaga Penjamin Simpanan/LPS). LPS is based in Jakarta and its secretariat office is registered at Equity Tower Lt 20-21, Sudirman Central Business District (SCBD) Lot 9 - Jl Jend Sudirman Kav 52-53, Jakarta 12190. Minimum S1 in Informatics or Electrical. Minimum 2 years of experience in the field of IT or General Affair/Logistic. Preferably mastering in IT networking and able to manage and maintain equipment and office facilities; sound system and video, PABX communication, CCTV, door lock system, touch countrol Air Conditioner and other IT base equipments. Minimum S1 in Economics, Management, Mathematics, Statistics with minimum GPA of 3.00 from a reputable university. Minimum 2 years of experience in the same field. The candidate with prior experience in banking, insurance, financial company or government institution is preferred. Minimum 2 years of experience in same position, corporate communication, public relation or marketing or finance on banking, insurance or government institution. Preferably mastering in institutional/agencies protocol, public and media relations management, communication and publication management. Maximum age of 43 years old. Minimum S1 or S2 majoring in Economics, Finance, Accounting, Management. Minimum 8 years of experience in financial industry, investment in the bond market (fixed income) and money market. Previous experience in Corporate Finance, Investment Management, Fixed Income Securities and Cash Management is preferred. Mastering PSAK and Financial Report Analysis. JobsCDC.com now available on android device. Download now on Google Play here. Please be aware of recruitment fraud. The entire stage of this selection process is free of charge. Lembaga Penjamin Simpanan - Recruitment Staff, Division Head LPS April 2017 will never ask for fees or upfront payments for any purposes during the recruitment process such as transportation and accommodation.